I placed these prints up in the last couple of weeks. Apart from the first two Wizbang! 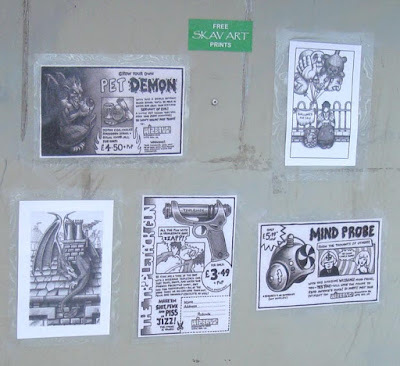 prints that I had left, I also added a third, which was The Triplejack Gun. After that I printed out two other artworks, which were The Balloon Seller and The Neighbourhood Watcher (these two do have printed info on the back but are still signed and numbered by me). 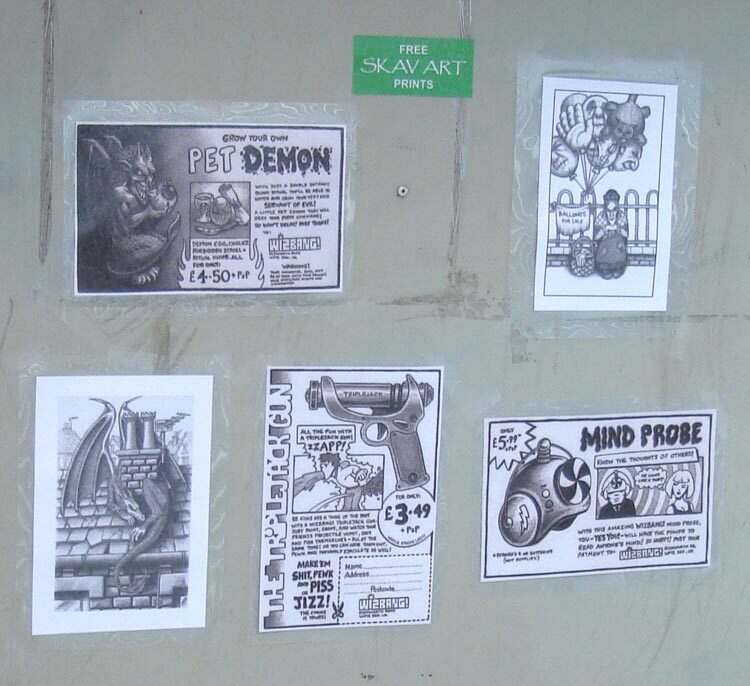 As you can see from the picture, I even included a small sign "Free Skav Art Prints" to encourage people to take them. In the end, I didn't really need to add that as it does appear that more people are taking them. In some cases, faster than I can put them up. This is fine. As I said in a previous post, they are yours to take if you see any of them around. I know that some are being removed and thrown away due to the perception that it's just untidy fly-posting, which is a bit much when you look at the photo above where you can still see the old tape marks of those that do fly-post without concern. At least I try to make the effort not to cause such damage. So it might be best to grab them when you see them. I'll try to do more print runs of other artworks in the future. The main reason I don't do them so often and keep each one down to 20 copies is mostly due to cost and my very limited resources. But they are fun to do and I hope you like them.